Crepes - How to Make Crepes - Easy recipe with only 6 ingredients! 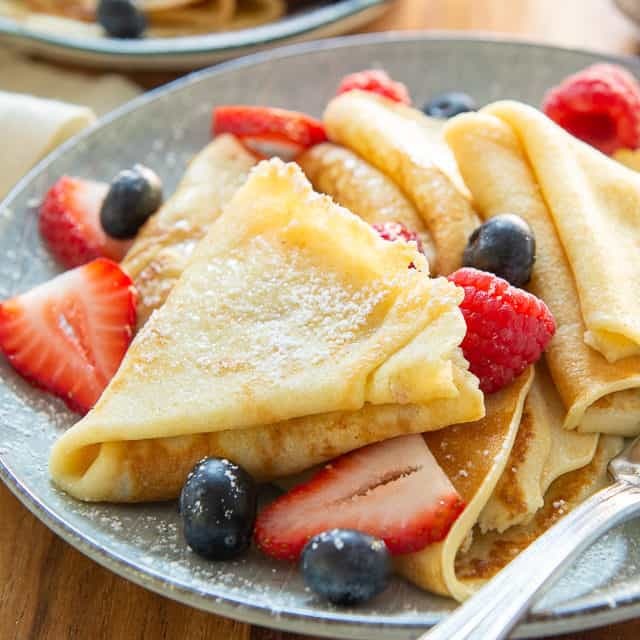 These homemade Crepes are made with only 6 ingredients, and have the classic eggy flavor you’d expect from these thin and delicious pancakes. They can be served many different ways! 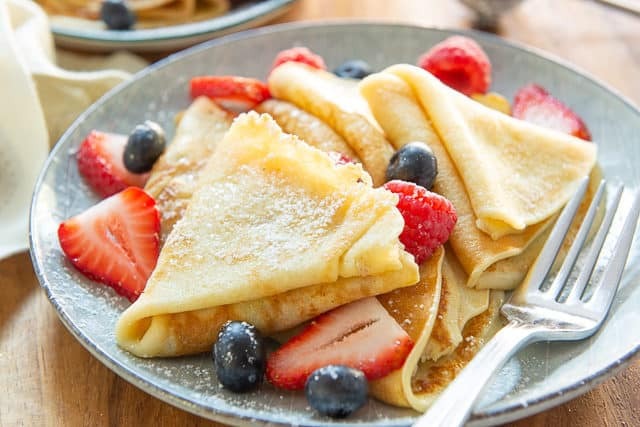 I love a good batch of Buttermilk Pancakes for its fluffy texture, but there’s something about the flavor and eggy texture of crepes that’s SO GOOD. I first fell in love with crepes while living in NYC, when a bunch of creperies opened up around the city. I couldn’t believe that these places sold ONLY crepes, but once I saw the menu, I realized how many different ways they can be prepared. They can be eaten on their own, with a simple dusting of sugar and some berries, they can be drenched in various sweet sauces, filled with Nutella, or even go completely savory, stuffed with arugula and raclette cheese. They’re so versatile! The batter is very easy to whip up, and can also be made a day ahead. 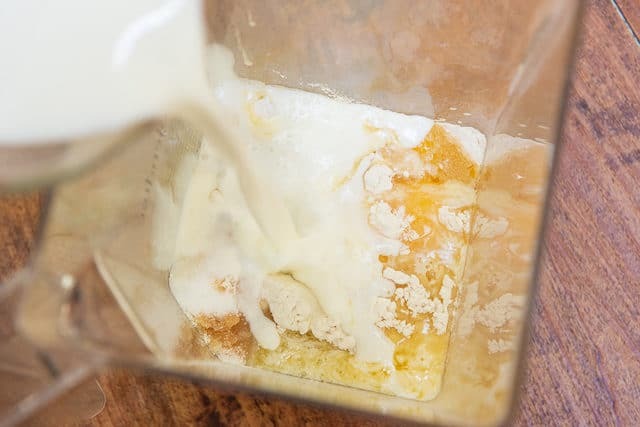 Blend together for about 15 seconds, until no flour pockets remain and everything is combined. Tap the blender container against the counter several times to make the bubbles rise to the surface and break, then refrigerate for 30 minutes. 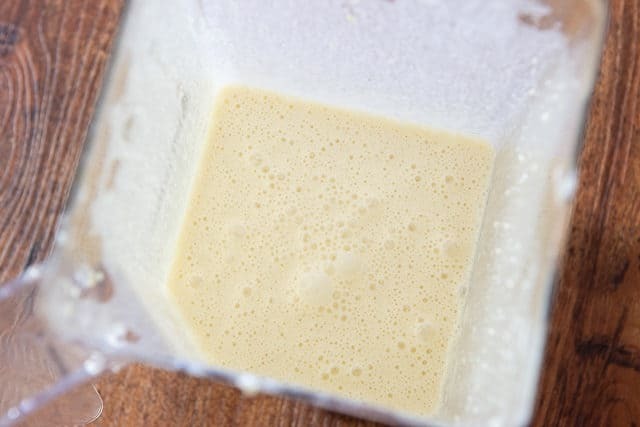 The refrigeration time gives the batter a chance to become more cohesive, and also gives the bubbles time to rise out of the batter. If you’re truly in a hurry, you can skip that step, but the batter is a little less easy to work with. That’s often why I like making the batter the night before, so I don’t even have to wait in the morning! 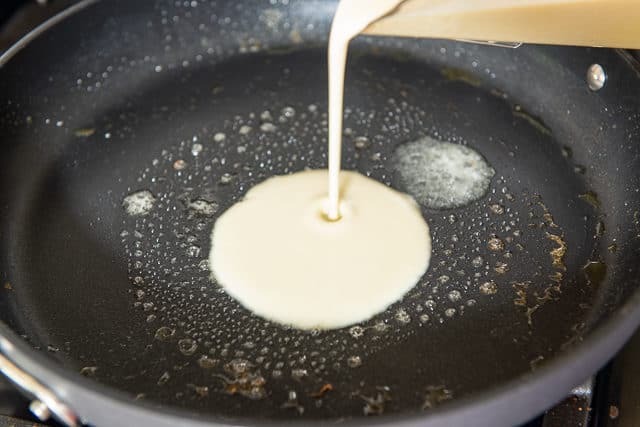 To cook the crepes, melt butter in a nonstick skillet, and pour in the desired amount of batter. 1/4 cup is a good place to start, but truthfully I pour directly from the blender container and go by eye. Use a spatula or a crepe spreader (affiliate) to spread the batter evenly. I don’t have a spreader, and know I could get more perfect circles with one, but truthfully I fold my crepes anyway so they don’t have to be perfect! I also don’t like to spread them too thin, but you can spread them however thin or thick you like. Cook for about 30 seconds on the other side, then repeat with the remaining batter. Whole Wheat Pancakes and Cinnamon Roll Pancakes are some of my other favorite sweet breakfasts. For savory, I love this Potato Frittata, and this Breakfast Burrito. Enjoy! Can Crepes be frozen? Yes, they freeze well. Store in an airtight container for up to 2 months. Can Crepes be made ahead? Yes, the batter itself can be made the night before and stored in the fridge. Also, you can cook them completely, then either freeze them or store them in the fridge. For the best flavor, try not to make them more than 2 days ahead. How to reheat Crepes: This is an instance where the microwave actually works really well. Microwave in a closed container (with a lid) until warm. How to store crepes: Once they’re cooked, they can be stacked right on top of each other. No need to put wax paper between them or anything. They will keep in the fridge for about 5 days. 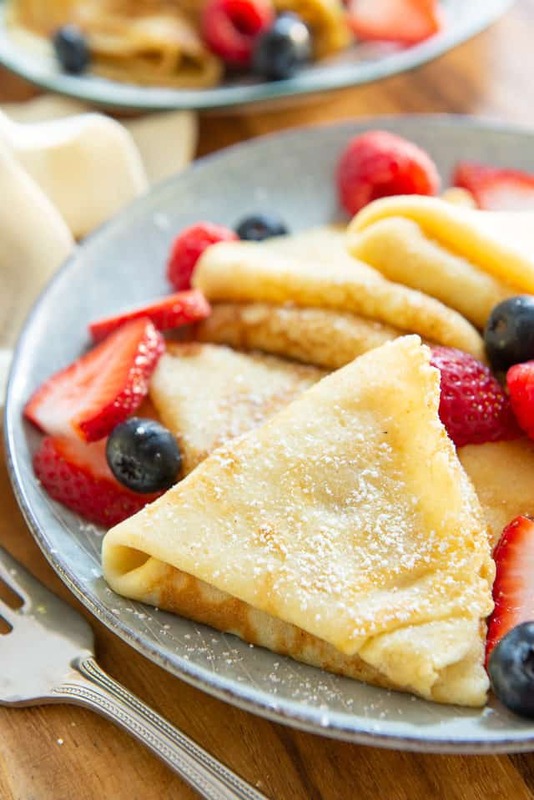 These 6-ingredient Crepes have the classic eggy flavor you'd expect from these thin and delicious pancakes. They can be served many different ways! Combine all ingredients in a blender and blend for 15 seconds, until combined. Gently tap the blender container on the counter a few times to make the bubbles in the batter release, then place the crepe batter into the fridge for 30 minutes. 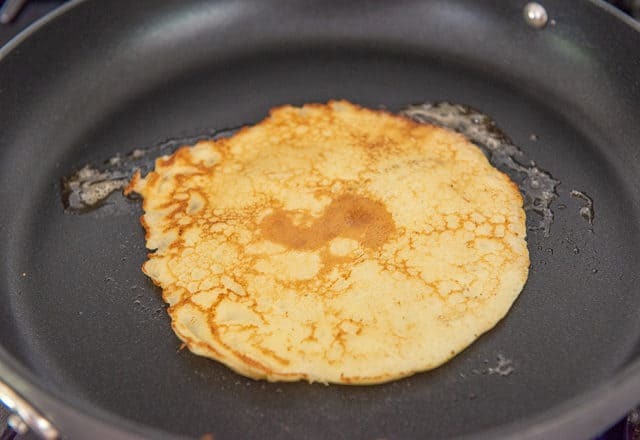 Heat a nonstick pan over medium heat for a few minutes, then pour the desired amount of batter into the pan (1/4 cup is a good place to start), quickly swirling it around to spread it evenly (or even better, using a crepe spreader). Cook the crepe for 45-60 seconds, until browned on the bottom. Flip the crepe, and cook for about 30 more seconds, until brown on the other side. Repeat with the remaining batter. Serve the crepes rolled or folded into triangles, and with any garnishes you'd like. I usually do a dusting of confectioner's sugar and berries, but you can also fill them with whipped cream, lemon curd, and more. If you screw up the first crepe or two, don’t worry. Use your intuition, adjust your heat if necessary, and your technique will get better with each crepe you make. *Any fat percentage of milk works here, but I like whole milk. 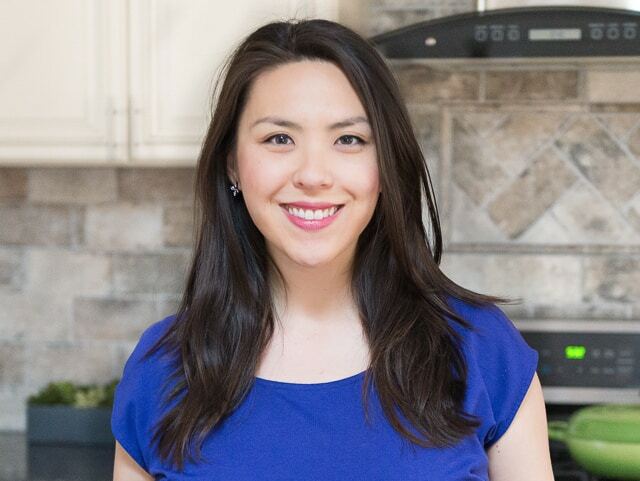 **This is a case where I like to use salted butter instead of unsalted, but both work. 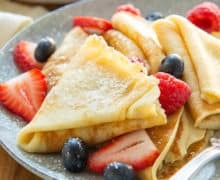 ***Using butter will give the crepes speckled browning and extra flavor, whereas only using the nonstick pan will give it more even browning. Both work! Post updated in October 2018. Originally published in December 2010. These are so easy and SO yummy! Great tutorial on how to make perfect crepes! Thanks for this recipe. I just love it made it several times since I’ve found it and always turns out great. I have made these 2 times so far, and as a person who normally hates pancakes of all kinds, I found this recipe absolutely delicious! I also especially love adding yogurt to crepes instead of cream because I find that it has more flavor but less fat. Thank you so much for this tasty recipe!